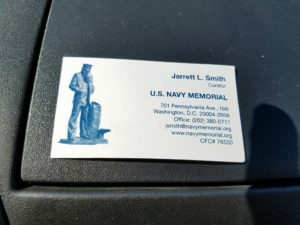 Joe’s good friend Dawn hand delivered the Murphy bell to the U.S. Navy Memorial in Washington, DC a couple of days ago. Joe was in charge of the bell until he passed this summer. 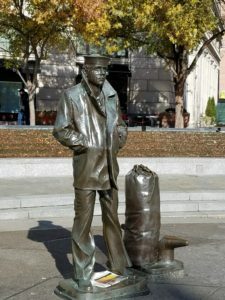 The last Murphy survivors decided that the Navy Memorial would be the best place for it. Thanks, Dawn, for hand delivering! Thanks Dawn and Paul for taking care of the ship’s bell. It is a relief to know it is in its proper place. 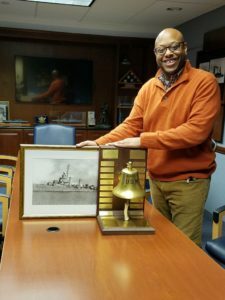 When we were having reunions, each year we rang the bell one time for each shipmate who passed during the previous year. It is the bell from the ship after it was rebuilt because of the October 1943 collision. The first bell went down with the bow of the ship. Thanks to all who had a hand in getting the bell to a most-fitting new home. On several dives to the Murphy bow site off the coast of New Jersey, our diiver friend, Dan Crowell, attempted to locate the original bell, but he never found it. So, hopefully, it remains at the Site somewhere. And thanks to the Memorial for accepting it! Fred Sheller.